By: Richard Edward McDorman, Jr. The renowned historical linguist Hans Henrich Hock once commented that, for reasons that are not well understood, there sometimes appear “curious gaps” in the bilabial slot of languages’ series of obstruents. Hock based his comment on the observation that if a language lacks a voiceless stop at one of the cardinal points of articulation, the missing segment is almost always /p/. Labial Instability in Sound Change explains the driving force behind this phenomenon. 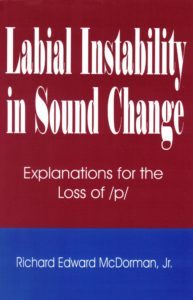 In this elegantly crafted solution to the longstanding problem of “labial instability,” linguist Richard Edward McDorman, Jr. clarifies the complex relationships among speech perception, acoustic and articulatory phonetics, language typology, and sound change.